6.3 What is a Design Pattern? 9.1 What is the Concurrency and Resource Architecture? 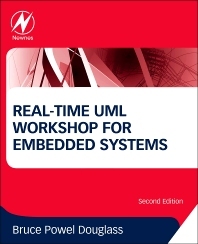 Written as a workbook with a set of guided exercises that teach by example, this book gives a practical, hands-on guide to using UML to design and implement embedded and real-time systems. A review of the basics of UML and the Harmony process for embedded software development: two on-going case examples to teach the concepts, a small-scale traffic light control system and a large scale unmanned air vehicle show the applications of UML to the specification, analysis and design of embedded and real-time systems in general. A building block approach: a series of progressive worked exercises with step-by-step explanations of the complete solution, clearly demonstrating how to convert concepts into actual designs. A walk through of the phases of an incremental spiral process: posing the problems and the solutions for requirements analysis, object analysis, architectural design, mechanistic design, and detailed design. Professional embedded systems engineers, undergraduate and post-graduate students. "The book is quite useful for both practitioners and teachers concerned with the modeling and design of real-time systems. There are many illustrative diagrams and detailed explanations." Embedded Software Methodologist. Triathlete. Systems engineer. Contributor to UML and SysML specifications. Writer. Black Belt. Neuroscientist. Classical guitarist. High school dropout. Bruce Powel Douglass, who has a doctorate in neurocybernetics from the USD Medical School, has over 35 years of experience developing safety-critical real-time applications in a variety of hard real-time environments. He is the author of over 5700 book pages from a number of technical books including Real-Time UML, Real-Time UML Workshop for Embedded Systems, Real-Time Design Patterns, Doing Hard Time, Real-Time Agility, and Design Patterns for Embedded Systems in C. He is the Chief Evangelist at IBM Rational, where he is a thought leader in the systems space and consulting with and mentors IBM customers all over the world. He can be followed on Twitter @BruceDouglass. Papers and presentations are available at his Real-Time UML Yahoo technical group (http://tech.groups.yahoo.com/group/RT-UML) and from his IBM thought leader page (www-01.ibm.com/software/rational/leadership/thought/brucedouglass.html).